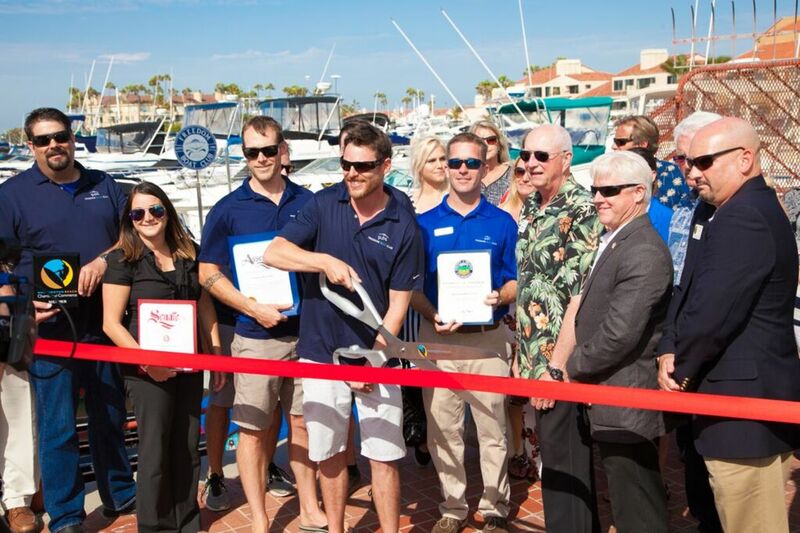 Andrew Hard, owner-operator of the Freedom Boat Club franchise in Huntington Beach, Calif., cuts the ribbon during grand opening festivities. Hard is flanked by Freedom Boat Club President and CEO John Giglio (right) and San Diego franchise owners Dan Hasbrouck and his wife, Jennifer (left), along with a group of regional dignitaries and VIPs. As part of its ongoing strategic growth and expansion plan, Freedom Boat Club announced the launch of a dozen new franchise-owned clubs, including West and East Coast locations. Huntington Beach, Calif., is the site of the newest franchise, and it is the second launch for the brand in California in the past 18 months. The first one was in San Diego. A grand opening event was held in late June at the club’s Peter’s Landing Marina that attracted representatives of the California State Assembly and dignitaries from the California State Senate Office, the city of Orange and the Huntington Beach Chamber of Commerce. Club President and CEO John Giglio also participated in the grand opening festivities. On the East Coast, another new franchise made its Florida debut in New Smyrna Beach in June, joining more than 30 clubs operating in the state. Bobby Parker, of Parker Yacht Sales, the son of former Sea Ray dealership owner Roy Parker, of Orlando’s Parker Boats, opened the Daytona Beach Freedom Boat Club franchise in 2014 and won the “Rookie of the Year” award. He added the second club location to meet growing member demand. Parker’s organization has doubled its membership in the past year and expects that the new club will further build its base. The new club is in shared building space with a paddleboard company in a private lagoon. It has installed new docks and piers and has options to handle as many as three dozen boats in the future. In 2016 Parker has his eye on Florida’s Palm Coast for continued club expansion. Other recently launched 2015 franchise locations include Fort Lauderdale, Stuart and Deerfield Beach, Fla.; Brick, N.J.; St. Joseph, Mich.; and Huron, Ohio. Additional new locations confirmed to open either later this summer or for the 2016 season include Lake George, N.Y., and Deep River, Conn., along with Miami and a second corporate-club location in Fort Myers Beach, Fla.